Is a practical solution in light of the CRDs ban on organic waste at Hartland Landfill. 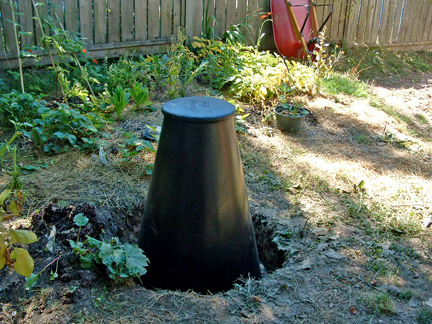 Place your Backyard Digester in a sunny spot, preferably near your garden. With a shovel, mark the outside diameter of the Backyard Digester and then place the unit to one side. Dig out the circle you have just marked to a depth of approximately 12”. Leaving a 4” step on the outside, dig out the centre of the hole as deep as possible (approximately 24”). Set your Backyard Digester on the step and backfill the soil solidly around the Backyard Digester. This will anchor the unit in place. It is now ready for use! If you have loose, sandy soil and rats are a concern, please follow these additional installation instructions. Place your digester in a sunny spot, preferably near your garden and away from your house or any structures. With a shovel, mark the outside diameter of the digester and then place it to one side. Backfill solidly to ground level. (Not shown in diagram.) Your digester is now ready for use!